When it’s time to start your baby on his or her first foods, it’s an exciting but sometimes nerve-wracking time. Parents are naturally anxious about all of the new responsibilities that solid (or semi-solid) foods bring – choking hazards, allergies, and unwanted ingredients to name a few. Many of us choose to make our own baby food, which is a fantastic idea for so many reasons! Here are just some of the benefits of creating your own personalized infant cuisine. #1. It’s cost-effective. 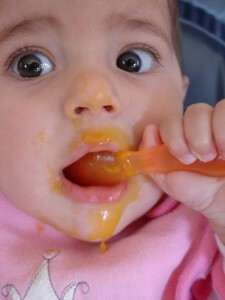 You can save a lot of money by purchasing and pureeing your own foods for your baby. As your very own chef, you have the ability to buy your produce in bulk and then batch your baby food. Store safely and freeze, so you have a personal supply of food that you can always count on at home. Instead of doing a jar-heavy grocery store trip, your baby food shopping will consist of trips to the market to buy plenty of fresh ingredients! #2. It’s green. Buying your own baby food is an eco-friendly commitment on many levels. You can choose to only purchase ingredients that have been cultivated with green practices by buying pesticide-free, organic, local produce. Making your own baby food is also another way to cut down on trips to the store, consumer packaging, shopping bags and receipts. You can re-use all of your containers, or make small batches for at-home meals! Fewer packages, fewer ingredients and fewer risks make for some clean, green baby meals. #3. It’s nutritious. You can exercise control over every single ingredient that goes into your baby food –and the simpler the better. Some baby foods contain fillers that you likely don’t want to waste time or money on feeding your infant –whether water, tapioca or other manufactured starches. This way you can ensure nothing but whole ingredients find their way into your recipes. Plus as your baby gets a little bit older, making your own purees can help you combine different ingredients and mask some of the nutrients that your picky eater might not like. Hide the taste of carrots by pureeing them with fruit, or sneak a little bit of ginger into your apple sauce. You can get creative while maintaining total nutritional integrity. If you’re starting the transition to solids soon, make sure to stay tuned four our next Introducing Solids workshop! There’s lots you can learn about your baby’s nutritional needs and digestive system before you start this next step. Experts Aviva Allen, Registered Nutritionis, and Kristin Heins, ND, are a great pair at hosting these friendly, jam-packed sessions! Bring your little foodies, your questions, and get ready to learn.